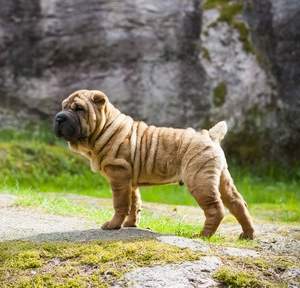 The Chinese Shar-Pei is a defensive and steadfast pal, whose wrinkly skin is a distinguishing trait that catches lots of attention from those who have the opportunity to be within its presence. This particular dog breed, which is more suspicious towards strangers than it is welcoming, needs to be introduced to social environments at a young age. By raising them to be comfortable in social situations, they will become more accepting towards strangers and friends of their owner’s family. Another reason raising a Chinese Shar-Pei in this way can be beneficial, is the fact that this breed’s intuitive nature will allow them to develop a sense of good character among humans, thus causing them to trust those who are friendly and be wary of those who might pose a possible threat. Chinese Shar-Pei's typically have an independent and reticent disposition that assumes a certain degree of respect from its peers. In the case that a Shar-Pei is raised with insufficient exposure to strangers at a young age, the dog will develop territorial tendencies that could result in them expressing hostility towards those whom it is unfamiliar, including other animals. If you are searching for a dog to accompany any small children that you may have, then this breed may not be the best choice for you. Although they are playful and compassionate towards their owners, these dogs are known to have an independent character that often attempts to challenge their master’s authority. Keeping this in mind, one must maintain the hierarchy of an owner-dog relationship by reiterating your position as an owner through using positive reinforcement to establish boundaries. Once the respect of a Chinese Shar Pei is achieved, it will express a degree of unwavering loyalty to its owner that is only matched by very few other dog breeds. It is due to the strong attachment this dog forms with its owner and other loved ones, that causes them to prefer being close to their master at all times. Requiring a moderate amount of exercise, Chinese Shar Peis will stay healthy and content with a 20-minute walk each day and perhaps the occasional frolic in the park. The minimal amount of exercise that is needed for Chinese Shar Pei's is the primary reason as to why they are virtually able to adapt to any home environment, whether it be a city apartment or rural farmhouse. Chinese Shar Peis typically prefer weather that provides mild temperatures. Due to their very short coats, this breed requires a sweater or jacket of some sort to persevere in cold weather for extended periods of time. However, this breed also has a very short nose that disables them from panting as well as other dogs. This inadvertently causes them to be intolerant of hot weather as they will be unable to cool themselves off effectively and will require more time indoors to avoid exhaustion. Known to be one of the more silent of dog breeds, Chinese Shar Pei typically only bark when they are in a state of worry or playfulness. It is highly advised that, due to the level of commitment that is required to raise this dog properly, only experienced dog owners should adopt this breed. The Chinese Shar-Pei posses the unique trait of a blue/black tongue that is only shared with one other breed known as the Chow Chow. This dog’s name, Chinese Shar-Pei, directly translates to “sand skin”, which accurately describes the short and rough texture of its coat. Originating from the Guangdong region of China, this dog was utilized by Chinese peasant farmers to protect livestock, hunt wild boar, and also served as a watchdog that would effectively guard their owner’s home. Their intellectual and brawny nature is what made them very appealing to the common gambler who, at the time, pitted fighting dogs against each other for sport and entertainment. The Dah Let region of China was known for its vast population of gamblers who continued to breed these dogs for fighting. The Dog’s wrinkly coat, bristly fur, and curved canine teeth, were all traits that fight promoters made an extra effort to improve as it caused the breed to be more suitable for brawls within the fighting ring. Due to the introduction of many other dog breeds from the Western Hemisphere such as Mastiffs and Bulldogs, whose fierce temperament surpassed that of the Chinese Shar-Pei, Gamblers abandoned the practice of breeding Chinese Shar-Peis and instead relied on the more aggressive breeds to carry out their bidding. As Chinese Shar-Peis were neglected for their inability to compete with the other fighting dogs, their population decreased quickly. The endangerment of this breed only continued to worsen during the reign of China’s Communist government. Under the People’s Republic of China, a heavy tax was imposed on the ownership of dogs whereas only citizens in possession of great wealth could afford such a luxury. Furthermore, the Communist government then issued an edict that declared dog ownership a “decadent bourgeoisie luxury,” thus banning dog breeding altogether. Although Shar-Peis nearly became extinct as a result of these incidences, the very few that survived these hardships were rescued by Matgo Law, a Hong Kong dog enthusiast who strove to preserve the legacy of this breed. By reaching out to American magazine editors and dog fanciers, Matgo Law was able to devise a way to popularize this breed once again. By informing people about the endangerment that this precious dog species was experiencing, many American dog enthusiasts became enthralled by the breed. This then resulted in the dogs’ vast and rapidly increasing popularity that began during the 1970’s. 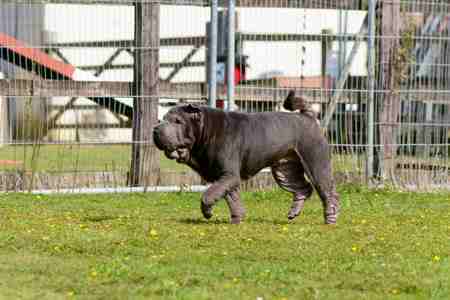 The Chinese Shar-Pei was then officially recognized by the American Kennel Club in 1992. Today, many kennels have been developed in dedication to the Shar-Peis as they continue to become admired by a broad majority of people. Due to the Chinese Shar Pei’s independent and intelligent character, they can, at times, be a challenging subject to train. Although this may be true, you will be rewarded with a loyal and trustworthy companion once the respect of this dog is achieved. Teaching these dogs basic house rules will be of no concern to you as they are usually very respectful and tidy. 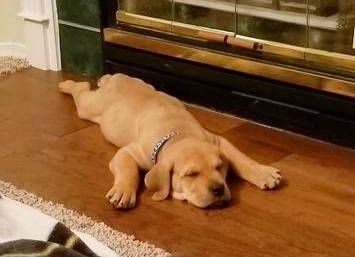 Chinese Shar-Peis are typically known to respond well to methods of positive reinforcement such as treats, praise, and play when being trained. The “click method” is another dog training technique that can be effective when raising a Chinese Shar-Pei. Known to be a dominant breed, these dogs will occasionally attempt to assume more authority than their master. In this case, one must make sure the dog knows its place in the relationship that it has with its owner. Also, because the dog’s individualistic attitude contributes significantly to it's overall character, it is equally important to admire and respect his/her status to maintain a healthy, mutual relationship. As an instinctive guard dog, Chinese Shar-Peis have a reputation for being defensive and sometimes even aggressive. As it was previously mentioned in the article, it is of utmost importance to raise this breed in social environments. Giving this dog a lot of exposure to human behavior at a young age will allow it to develop an understanding of friendly and unfriendly visitors. If one fails to raise their dog in this way, it will most likely become distrustful of those whom it encounters and may express unnecessary aggression towards them. When raised properly, though, these dogs can serve as an impressively effective guardian who will fend off anyone that threatens its master’s safety. 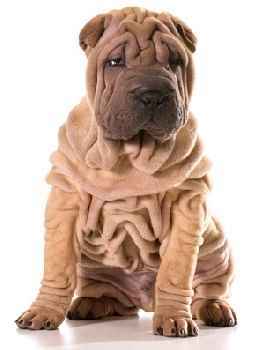 Although the Chinese Shar-Pei only requires being bathed every three months, it is imperative to clean the areas thoroughly within it’s wrinkles, particularly in the facial area, to avoid unhealthy accumulation of bacteria. It is also just as important to make sure that these areas are quickly dried after being washed to reduce moisture that can lead to fungal or yeast infections. Similarly to how frequently these dogs need to be bathed, they only require a minimal amount of being brushed once a week. Because of the Chinese Shar-Pei’s unusually short ear canals, one must take caution when checking for any infections in this region. To make sure that their ears are not damage when performing this procedure, it is suggested that one should have a veterinarian teach them the proper way to go about doing this. 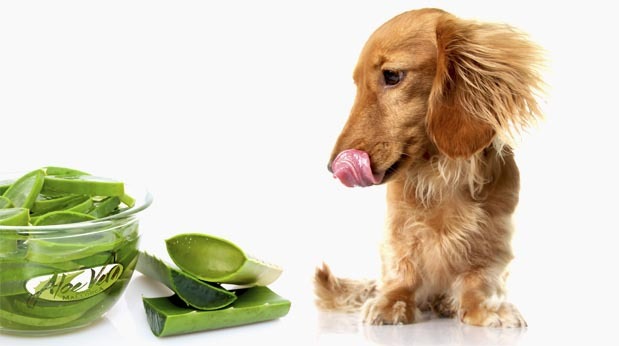 In addition to these necessities, the dog’s teeth should regularly be brushed to ensure its oral health. Like all dogs, Shar-Peis also need their nails to be occasionally trimmed. This can be done through the use of nail clippers or the most efficient tool of an electrical grinder. By educating yourself on the illnesses that are known to be common among Chinese Shar- Pei, you will be able to recognize certain signs in your pet’s behavior that can indicate these diseases, allowing you to prevent them from becoming a larger problem. 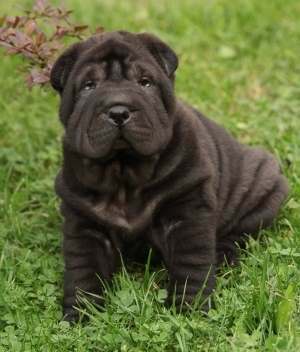 One other thing you must consider when adopting a Chinese Shar-Pei is to find a responsible and well-experienced dog breeder who thoroughly reports any genetic defects that have the capability of causing issues. 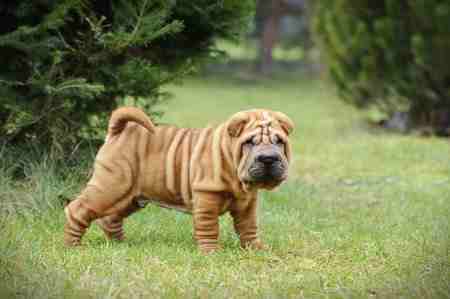 The list below contains any diseases that have had a history of affecting the Chinese Shar-Pei. Thanks to the help of social media, Chinese Shar-Peis have made quite the impression on modern society. 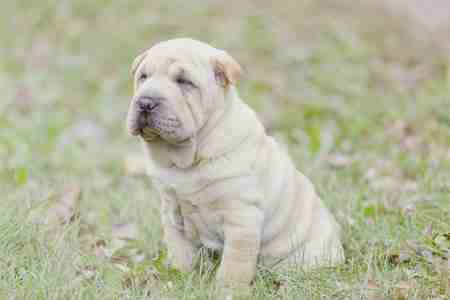 All over the Internet, Shar-Pei puppies are adored for their fuzzy and wrinkly coats. One puppy in particular, Tonkey Bear, lives up to his name through the way in which his short fur and large snout resemble that of a small bear. The owner of this Shar-Pei puppy dedicated an Instagram account to the pup which instantly became an internet sensation as it achieved 165,000 plus followers.